Ring after ring flew from their hands, aimed at the point of a witch’s hat. Three at the floor, one hitting the mark, and one hitting a human hotdog. But alas, at least one hat had been hooped around by the ring and was merit for a prize of chalk or bubbles. Why so much scary, carnival fun at the square? Why, it was the annual Huntsville Scare on the Square. Last Saturday the LEAP Center hosted a booth at Scare on the Square. Scare on the Square is an annual Halloween event sponsored by The Huntsville Main Street Program. About 40 different businesses, schools, and local organizations host games and activities for community children. Scare on the Square is sponsored by local businesses and it is a safe atmosphere for families to enjoy themselves. If you are creative and wear a costume it will spare you from having to pay the entrance fee of one dollar. Embracing this costume-wearing practice, the LEAP students arrived in a variety of costumes themselves from Minnie Mouse to Charlie Chaplin. With weeks of anticipation prior to Scare on the Square, the LEAP center engineering team (aka a few of the LEAPsters) designed a game built to increase levels of happiness to the maximum. In the end, we created the “Witch’s Hat Ring Toss.” Similar to a bean bag toss, it required the competitor to loop hat dressed cones with a pool ring. Let’s just say that hand-eye coordination was important in order to successfully master this enchanted game. With smiling faces, all the children (and even some LEAPsters) patiently waited in line to play, ready to ring one or two witch hats. We had a few future athletes who knew at exactly what angle to throw the rings. Yet even more children measured wind speed, warmed up their best throwing arm, made their marks, and walked right up to the cones to place the ring into the hat. In between handing out rings and giving out candy, we amused ourselves by noticing the creative Spidermen, Pikachus, Elsas, Super Girls (we even had our own superwoman! ), as well as some actually frightening costumes. But even more rewarding was the look on their faces when they looped a hat (without cheating). With the LEAP center’s 1800 pieces of candy gone, we packed our tent and witchy game satisfied with the 400 plus jolly children that had visited us. We are grateful for the sponsors and coordinators of these events that allow us to interact with the community! 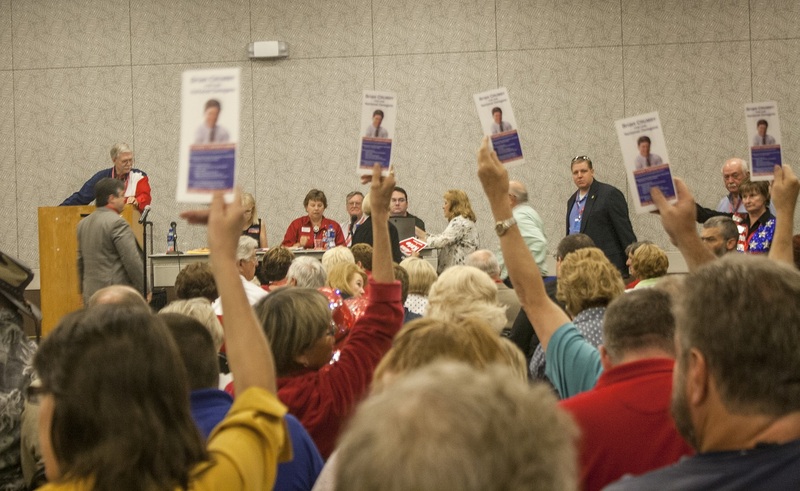 As a public service to the community, the Walker County Republican Women hosted a “candidates’ forum” on Monday night, inviting candidates at all levels and of all stripes to meet the public. 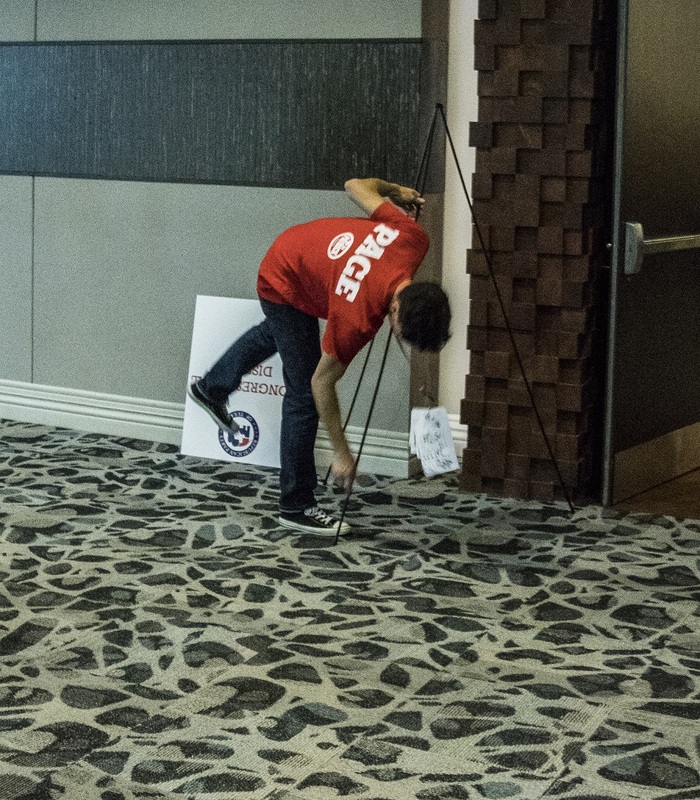 With five minutes to discuss their intentions and platform and an almost unlimited time to mingle, the forum provided a key service to the voting public. The Walker County Hospital District candidates were the first to speak. 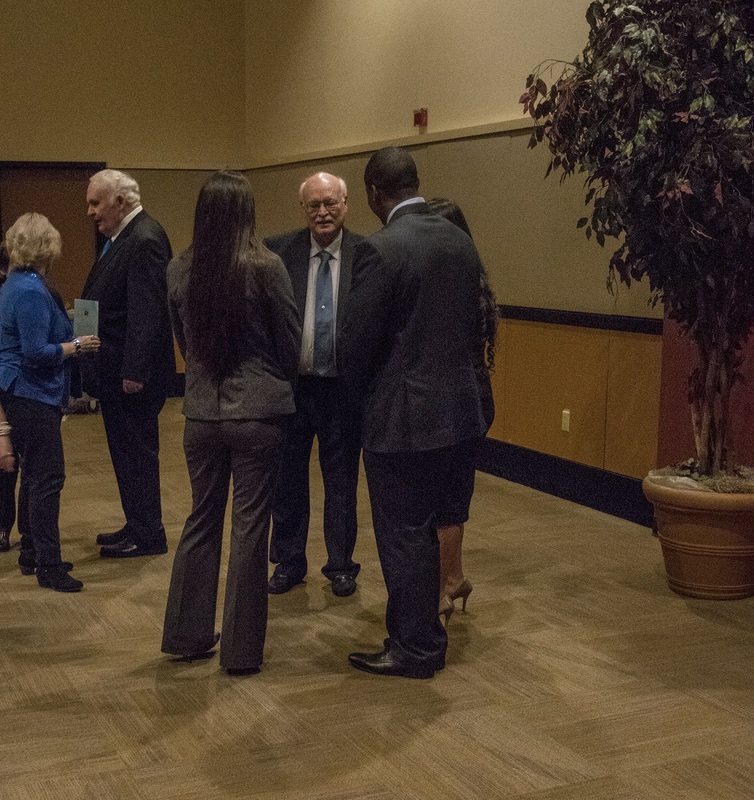 With three positions up for election and six candidates running for the position, the meet and greet was important to decide on who to elect this November. Two of the candidates currently serve on the board while the other four are seeking election for the first time. 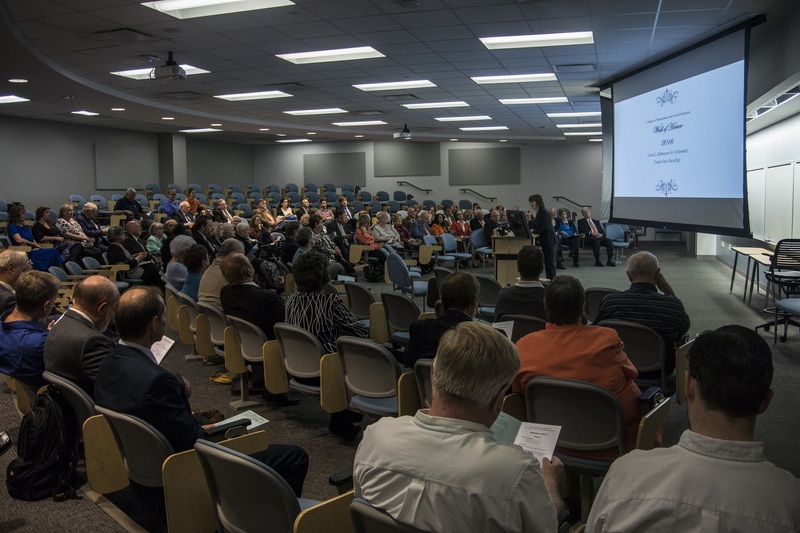 This was an informative meeting; we learned about the important distinction between the Walker County Hospital District Board and the Huntsville Memorial Hospital Board. 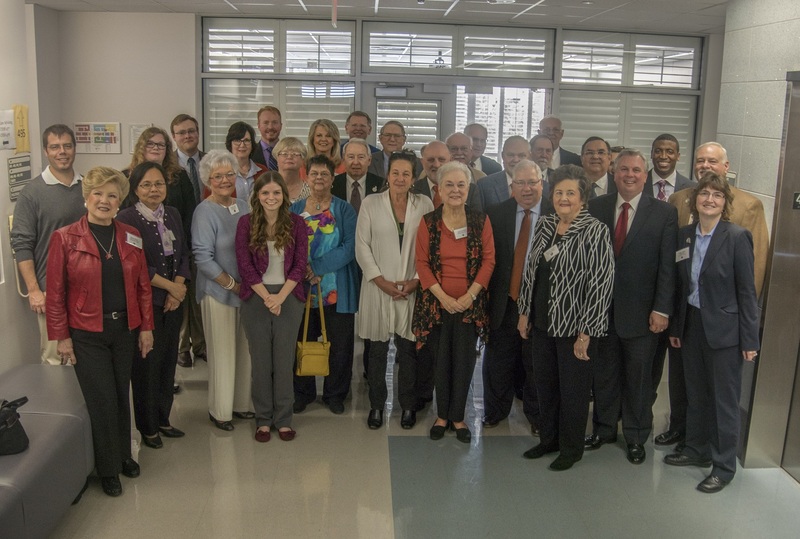 The Hospital Board is a board of directors composed of community leaders who oversee the broad direction of the Hospital. The Hospital District Board, on the other hand, is made up of elected officials responsible for overseeing the District, its finances, its physical structures, and its health care. Although this latter district has the ability to tax, such revenues only make up a small portion of the hospital’s overall revenues. With these weighty matters on our minds, we thanked the Republican Women for organizing the event, and we exited pondering upcoming decisions. Nonstop chanting filled the backstreets of SHSU as the community gathered for the 2016 Homecoming tailgate. As the first college tailgating experience for most of the LEAP students, we took on the crowds of students, parents, fans, pets, and Huntsville community members. The College of Humanities and Social Sciences (also known on campus as CHSS) kindly allowed the LEAP Ambassadors to join their tailgate celebration. As volunteers, our duties were simple; set up and help pass out food. We passed out over 1,200 chicken wings and they went fast! Many lined up to win a prize from the CHSS booth and get a sample of the savory wings. Although hot and crowded, the tailgate was a fun experience. Dean Abbey Zink and Associate Deans Rhonda Callaway along with Jerry Bruce also joined our pre-game celebration. It was great to see the community and faculty come together for our homecoming game against Abilene Christian University. After our shift with CHSS ended, many of the LEAP students explored the other booths to scout out their prizes and food. We ate pizza, turkey legs, sausage wraps, popcorn, and topped it off with some sweet tea. Various booths blared music and gave free SHSU merchandise. These school spirited trinkets and momentos where used to represent our school at the game which had begun right after the festivities. The chants continued all the way to victory against ACU (48-21). The LEAP Ambassadors are always happy to try new things, especially when it involves delicious food, fun football, and volunteerism! Tis the season for pumpkin spiced everything, Bearkat Football, cooler days and–for the Huntsville community–the Fair on the Square! Huntsville’s annual Fair on the Square attracts an average of 15,000 people to support small businesses and community engagement. Everyone, from Walker County and farther, congregated in Huntsville’s downtown square to shop for antiques, carnival food, crafts, and other treats. Glad to assist, the LEAP Ambassadors volunteered with the Walker County Republican Party and the Walker County Republican Women among this ocean of booths. Thus, we spent a morning selling jewelry, registering voters, and taking donations for campaign buttons, yard signs, bumperstickers, and t-shirts. 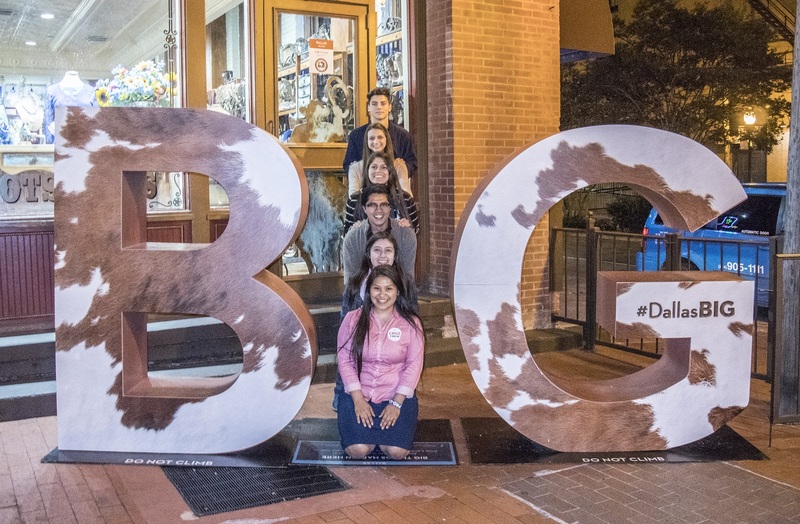 With a variety of booths showcasing all sorts of curiosities, from engraved pens to apparel from the Andes, the Fair attracted so much people that the streets flooded with shoppers eager to visit every inch of the Square. So being, the excited Republicans among the crowd visited our booths with an overwhelming eagerness to demonstrate their pride in their political activism. The day was a success for the Party as they sold out of many items, registered more than thirty voters in Walker County, and raised a bountiful amount of funds for local campaign efforts. For the LEAP Ambassadors, it was a nice way to spend a Saturday morning by learning about local businesses, shopping, and volunteering with the Republican Party and Women. We were also fortunate to catch up with the Battle of Piney Woods game afterward (Go Bearkats!!). With such an amazing Fair on the Square Saturday, the LEAP Ambassadors are already looking forward to volunteering next year! Rejuvenated from sleep, we woke ready for our day, which would consist of touring the University of Arkansas Law School, hiking and catching a movie to wind down. When we arrived at the University of Arkansas School of Law, we met with Ms. Kalesha McGraw, the Assistant Director of Admissions, and she welcomed us to the school before taking us to the student lounge for a quick overview of the law school. We learned about the admissions process, the class schedules and sizes, and the student life in Fayetteville. We also learned about notable (former) faculty such as Bill and Hillary Clinton. If Hillary Clinton becomes elected, University of Arkansas -Fayetteville will be the first law school to have more than one faculty member become President of the United States. The rest of the Q&A section with Ms. McGraw consisted of questions that ranged from the cost and the admissions process to the actual courses and the structure of the classes. After our informative Q&A session, we walked upstairs to observe Professor Day’s Professional Responsibility class. This is a required course and helps students prepare for the Multi-State Professional Responsibility Exam (MPRE). This exam is a prerequisite for taking the Bar Exam and tests law students’ knowledge on ethics. During the summer fewer students are on campus, but classes are still in session. The topic of discussion for class today was on conflicts an attorney may face during their practice. Throughout the class, the Professor explained conflicts using cases where ethical issues arose. To explain a complicated scenario, the Professor and students even role played a scene which presented the situation in an interesting and clear way. We enjoyed the class and our Professor’s informative teaching methods! …and the front of the school on our way out. Many thanks to Ms. McGraw and the University of Arkansas- Fayetteville Law School for their hospitality! After a morning filled with learning and a long trip, some of us decided to take a mental and physical break. Others, however, soldiered on, readying ourselves for a brief bit of shopping and a hike in Devil’s Den State Park. Before driving down highway 170 into Devil’s Den State Park, we stopped to peak into some shops in town. Once everyone was satisfied with what they had purchased, we began our journey to Devil’s Den. As our second hike of the trip, the first being the climb up Pinnacle Mt. near Little Rock, we felt prepared and pumped up for the rugged expedition that we were about to take part of. With the sun falling on the horizon, the weather was a prime condition to explore inside the woods. This 2,500 acre state park offers myriad outdoor activities, from rafting to camping to hiking. We chose the latter, embarking on the Devil’s Den Self-Guided trail, which is 1.5 miles round-trip. As we began on our trail we descended down masonry steps. Such modifications to the trails and other man made structures within the state park were once Civilian Conservation Corps projects from the Great Depression. The engineering talent of these laborers is clear when taking these steps and observing how strong they still are, even after almost a century of its construction! The traces of useful man made structures became fewer as we went deeper into the woods. Ahead of us stood trails traced through the rocky cliffs with trees filtering the sun and casting a serene shadow over the whole scene. Then, the trail neared a river, waters sonorously rushing through and echoing through the woods. This sound at times kept us focused, as we knew that as long as we kept the river at our left shoulders we were going the right way. Along the trail, at times encountering uneven, slippery and rocky ground, we found caves in which the temperature inside would lower presumably by ten-twenty degrees. The trail also goes by the more descriptive name of “Double Falls” Hike, so named because of two falls that appear about halfway through the trail. For us, though, the trail could have been named “Triple Falls,” because, hearing water of the main trail, we made tracks over a hill to find a small waterfall. …but this only added to the excitement of our discovery. …okay, frolicked may be too strong of a word. But we did have fun. We found additional falls further along our hike. Only a few feet beyond these falls was another waterfall, equally as delightful. From our trek we had worked our selves into perspiration and slight exhaustion. The refreshing, cool water of these natural showers, however, were just the perfect manna we needed to continue on our journey through Devil’s Den. From the falls, the hike wends it way downhill, which offers another striking view of the falls. And this perspective provided additional photo ops. 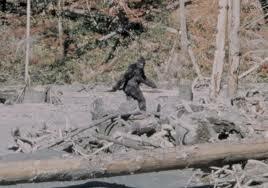 We even found another log bridge on which to climb. …we contemplated our accomplishments. We had finished another hike on our trip! With tiring limbs and sweaty backs, we climbed the van with a sense of victory and ready to relax and catch a movie. But, first, we made two more stops. We picked up food from Hammontree’s, an excellent grilled cheese specialty restaurant in Fayetteville. We also made our way to Mt. Sequoyah, the highest spot in Fayetteville, where we watched the sunset. It was, we thought, a fitting end to a wonderful trip. Once we had freshened up at the hotel, we climbed back into the van and drove to a near by movie theater to watch the remake of Ivan Reitman’s hit movie, Ghostbusters. Even though the original film is about 30 years old, most of us had previously watched it and waited in anticipation through the previews to see how similar this remake would be to our beloved original. We found many differences between the new film and the original Ghost Busters film, an obvious one being that women instead of men were playing the lead roles. Most of us focused more attention to the fact that Paul Feig’s film also includes multiple nods to Reitman’s original and Sigourney Weaver, Dan Akroyd, Ernie Hudson, Annie Potts and even Bill Murray make appearances. After an hour and forty-seven minutes filled with laughs that echoed in the theater (mostly Megan’s), we were ready to turn in for the night to prepare for our long journey home tomorrow morning. 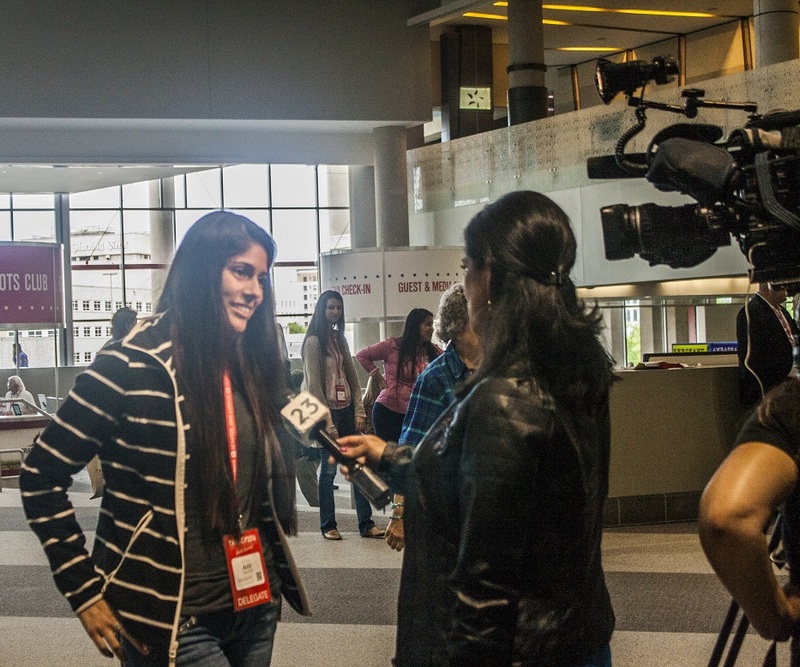 Our last day at the Convention was, in many ways, the longest. 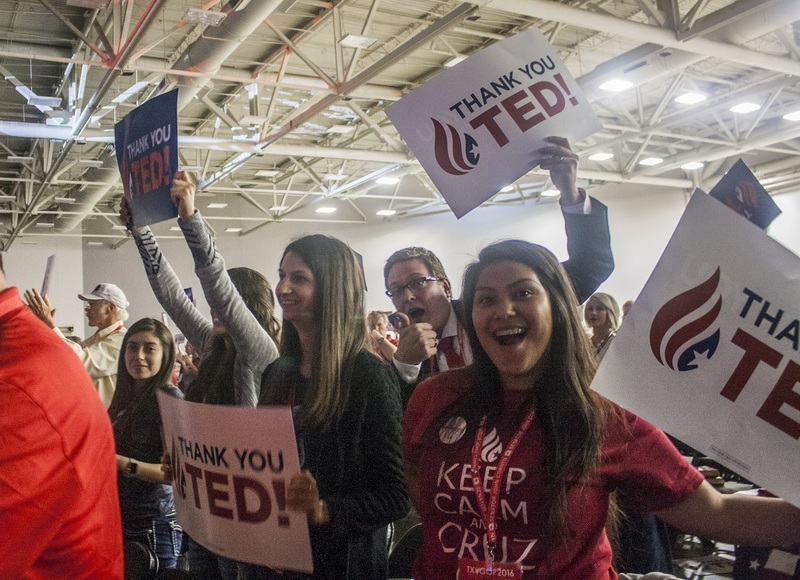 But for the Walker County Delegation, which overwhelmingly supported Ted Cruz for President, it was also a fun day. 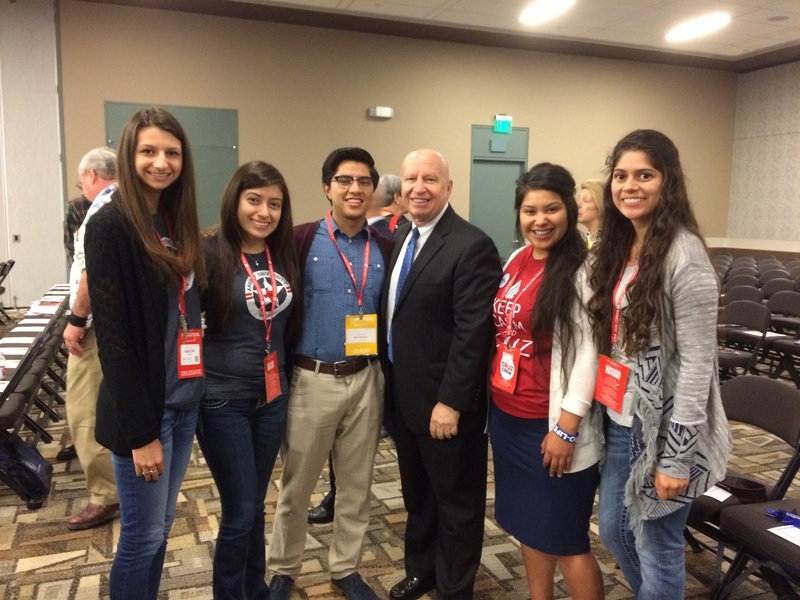 The first thing on our agenda was kolaches with Congressman Kevin Brady. It was there that we saw Francine Stanfield, Brady’s Campaign Manager, who recognized us from previous events for which we had volunteered. Both Congressman Brady and his staff were very welcoming to the Walker County Delegation and to us as SHSU students, as always. We congratulated Congressman Brady on his recent win and after meeting with him for a few minutes we proceeded to the breakfast table for kolaches and fruit to give us energy for the long congressional district caucus meeting ahead of us. Although we only had to vote on delegates and alternates to send to the national convention, it took roughly 6 hours. The meeting began shortly after 8am and ended around 2pm. 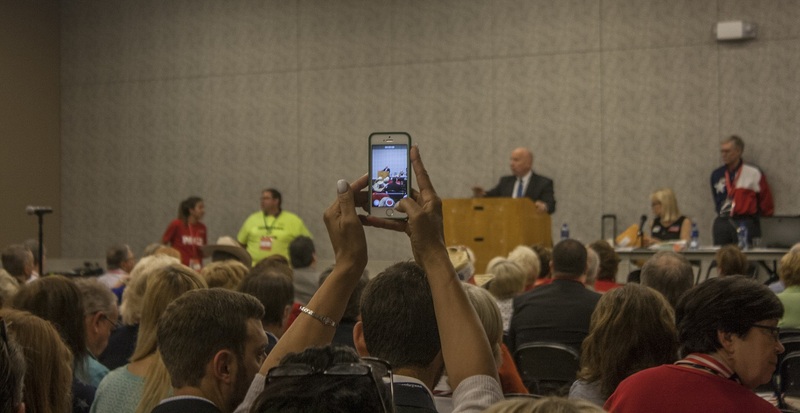 At this meeting we had to elect the delegates that would attend the National Convention in Cleveland, Ohio and also the party representatives who will represent us to the national delegation in Washington, DC. This process was interspersed with various speeches by elected officials or candidates. The first of these was the best, with Congressman Brady opening the proceedings. Start over for the next position. Because there were between 5-9 candidates running for each position, the process took a while. It was an interesting process, but it’s unclear exactly how meaningful it was. 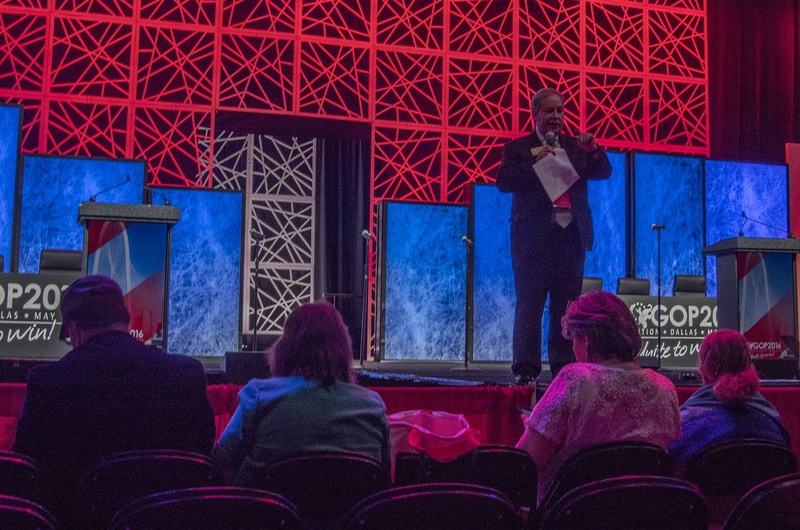 Each delegate elected to attend the national convention would have to pledge to vote for the candidate according to the state’s primary’s result. 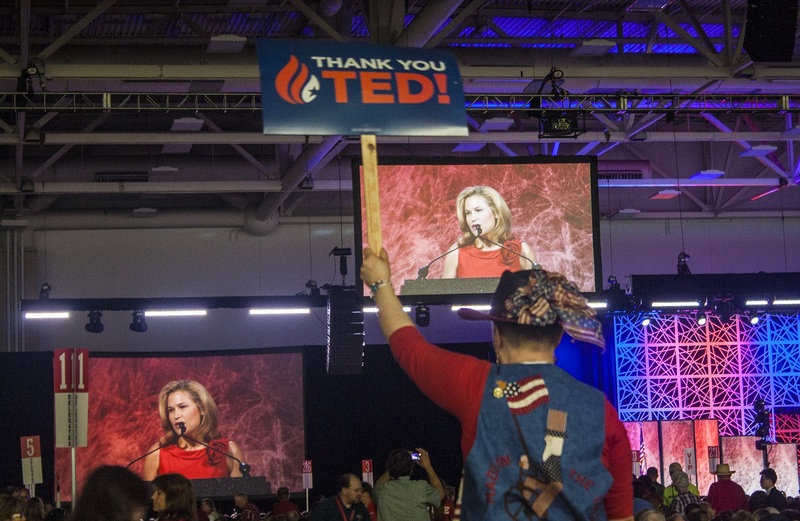 In the end Montgomery County Delegate Ann Kate fulfilled the position for first delegate, which was bound to vote for Cruz. Steve Toth of Montgomery County fulfilled the second delegate position, which also was bound to vote for Cruz. Finally Ann Mazone of Grimes County fulfilled the third delegate position, which was bound to vote for Donald Trump in the national convention. This last one was a special victory for our county’s Cynthia Prehoda, who had nominated her. By about noon, we decided we better get a group photo, while there was still a group left to photograph! After a busy morning of delegate voting, we decided that it was time to indulge in a satisfying lunch break. Thus, Megan Chapa, Kaitlyn Tyra, Kay Deahl, and I (Brian Aldaco) went down to Cafe Herrera. 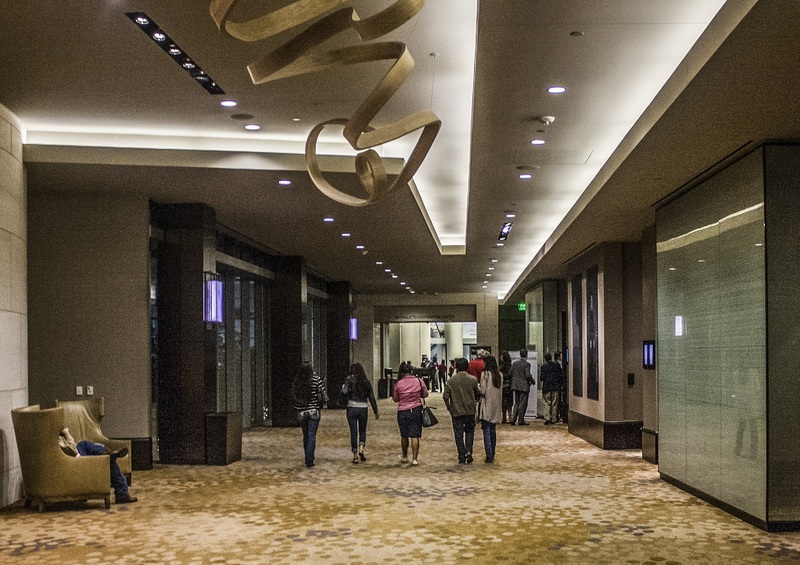 The Mexican cuisine style restaurant is conveniently situated a street across the convention center. 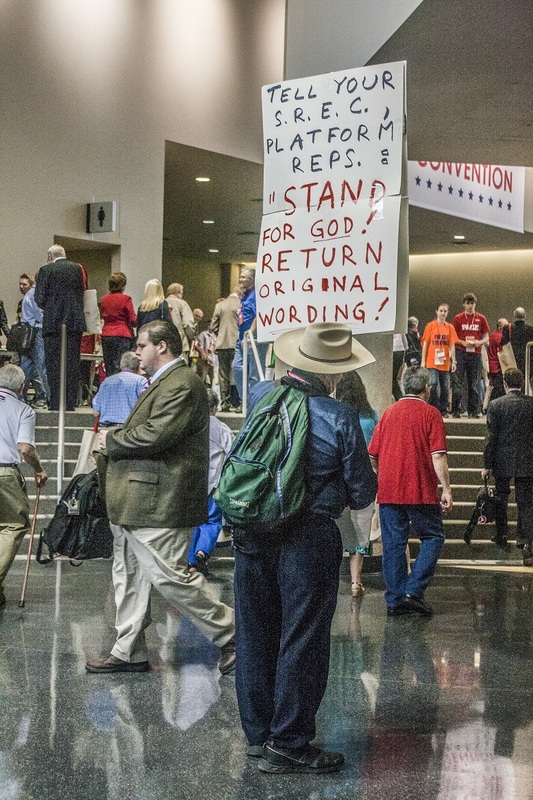 This allotted the sufficient time for the eager delegates to return in time for the remainder of the convention’s general session. Upon entering through the rustic Spanish-style doorway of the restaurant, the savory aroma of the sizzling beef pleasantly overtook our senses. This was a proper indicator that we had chosen the right lunching venue. With our menu items ordered we distracted our appetite with the classic Mexican chips accompanied by a spicy green salsa and an even hotter red salsa. The wait for our piece d’resistance was minimal, however, thanks to the quick cooking skills of the chef (surely he must have known of Ted Cruz’s imminent arrival). With our Enchiladas Verdes, Enchiladas Rojas, and tacos al pastor served, we continued to enjoy the entertaining anecdotes of Mrs. Deahl. 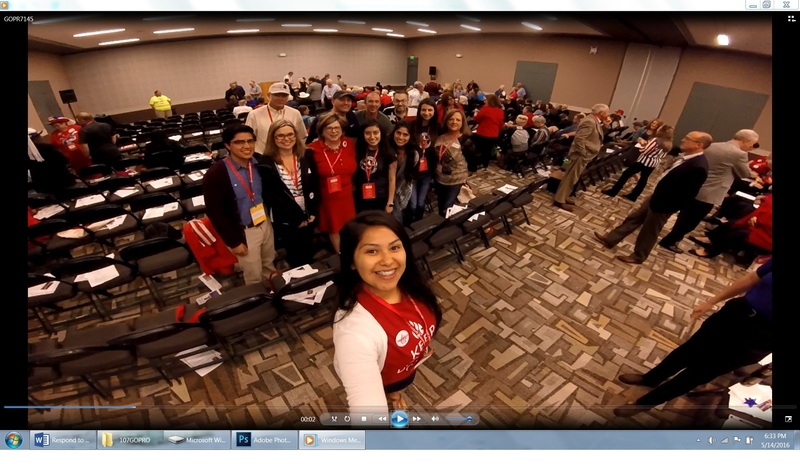 Sharing her history of Republican participation and college experiences made us consider our privilege to attend the State Convention with greater appreciation. After our plates were cleared we rushed across the road, entered through the convention doors, and climbed up the stairs. 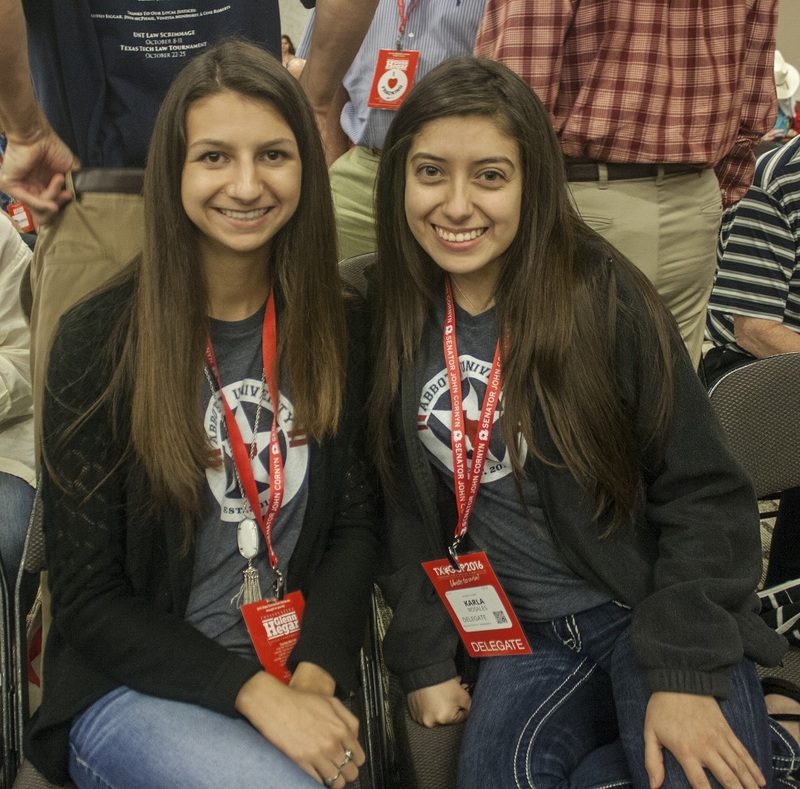 We were ready to continue fulfilling the duties of a State Convention delegate. 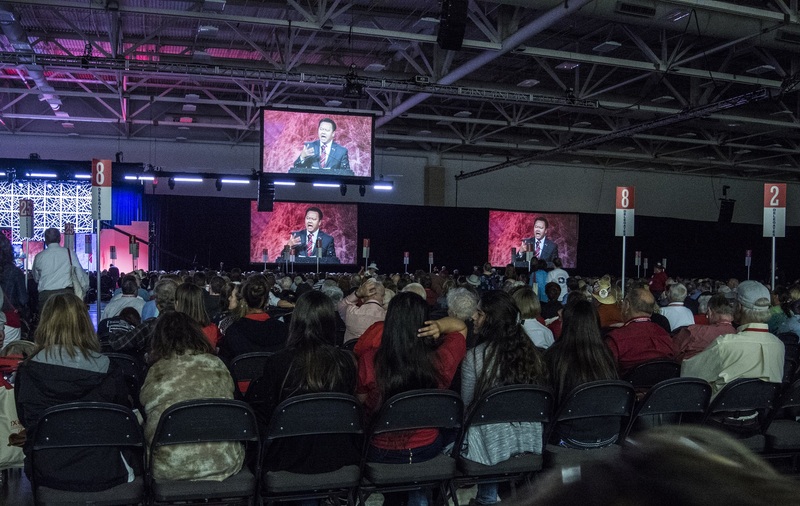 Texas Senator Ted Cruz was the speaker at the last main session. He won the Texas Republican Primary for the presidential candidacy so all the delegates were really excited to hear Senator Cruz speak! 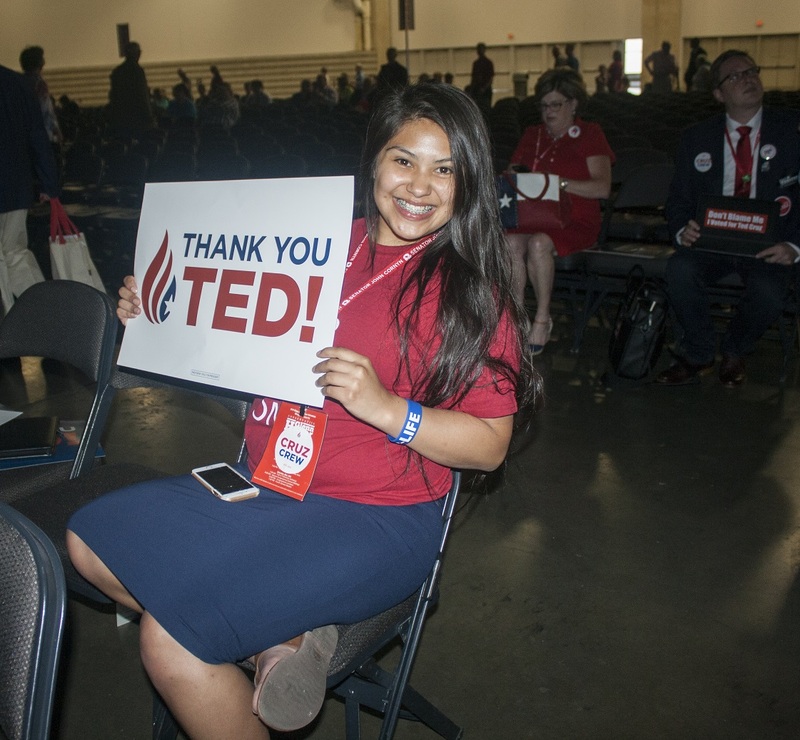 All the seats had “thank you, Ted” signs so that the delegates were able to show their appreciation for all of his efforts during his campaign race. His wife, Heidi Cruz, introduced him on stage. She gave us insight of their campaign tour and expressed how good it felt to be back home in Texas! All were happy that the two and their two children, Catherine and Caroline, sacrificed so much to represent Republicans all across the United States. Senator Cruz’s speech was very positive. He reaffirmed the beliefs that he will fight for in the Senate and how his unsuccessful presidential campaign will not hinder any future efforts during his office term. Although he did not endorse any candidate during his speech, he left many of us more hopeful about the future of our party and our nation. 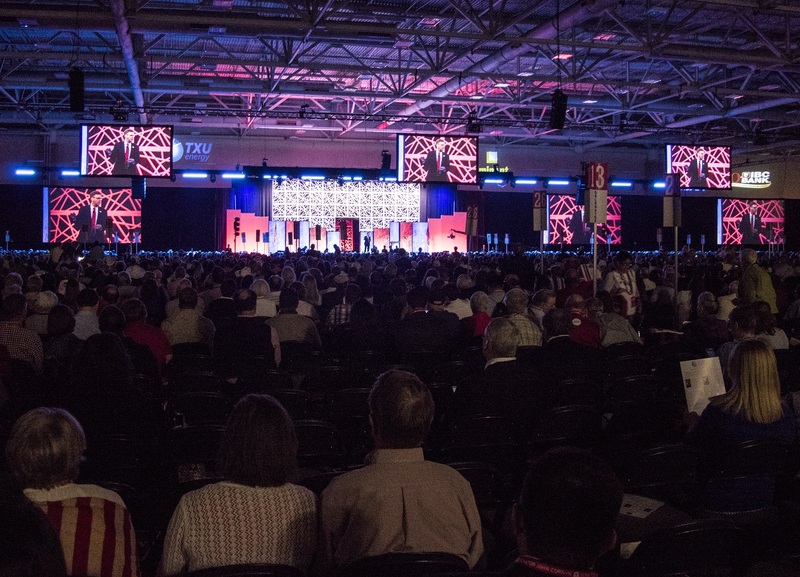 The excitement of hearing Senator Cruz speak gave many delegates energy as we prepared for the rest of the fourth and final general session. 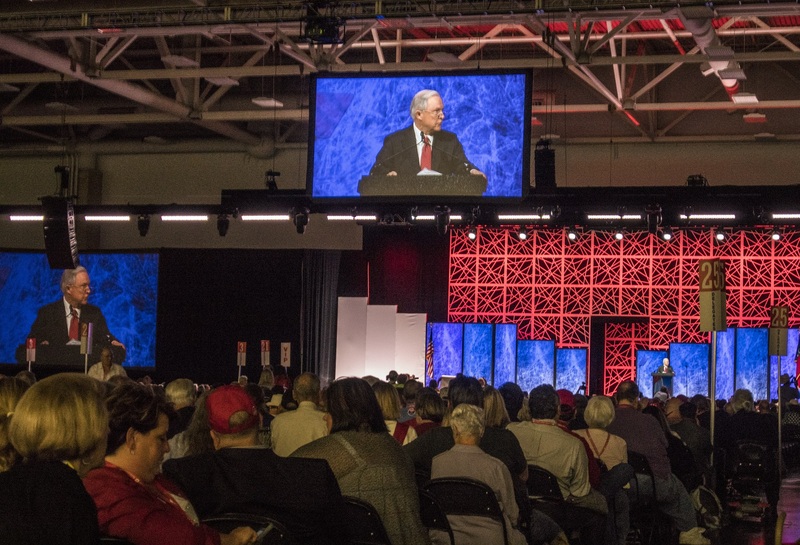 The Honorable Attorney General Ken Paxton–who, incidentally, is facing criminal charges as for Securities Fraud–gave remarks following Senator Cruz’s speech. He discussed his successes as Attorney General and some of the current issues Texas is facing. His speech informed delegates about his opinions on current events and how he plans to handle these situations. The Honorable Texas Commissioner of Agriculture Sid Miller (also under investigation) and the Honorable Texas Railroad Commissioner Ryan Sitton also spoke to delegates. 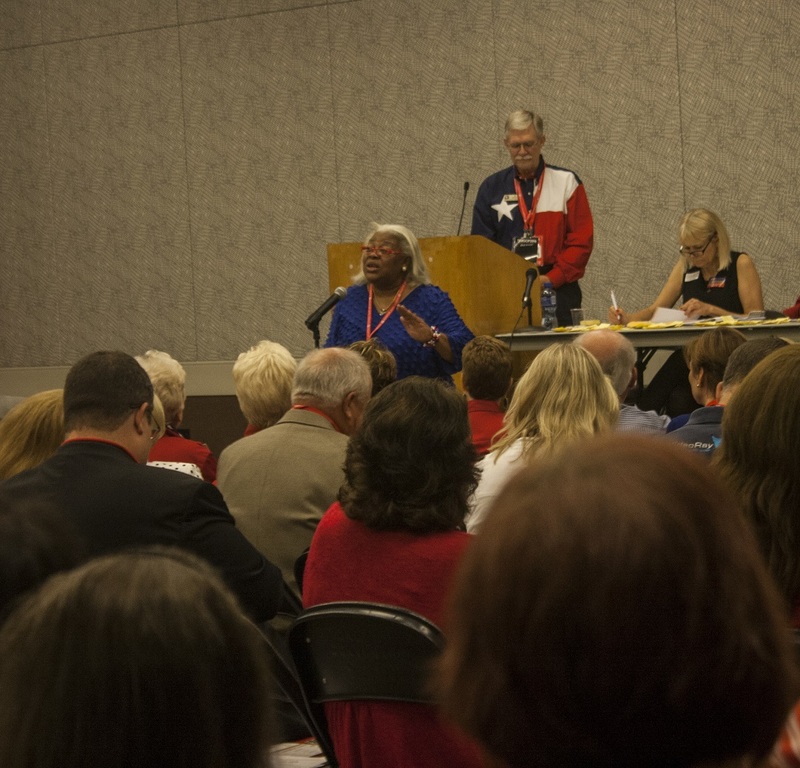 Thanking the delegates for their continued support, their speeches were generally positive about the future of the Republican Party and the State of Texas. 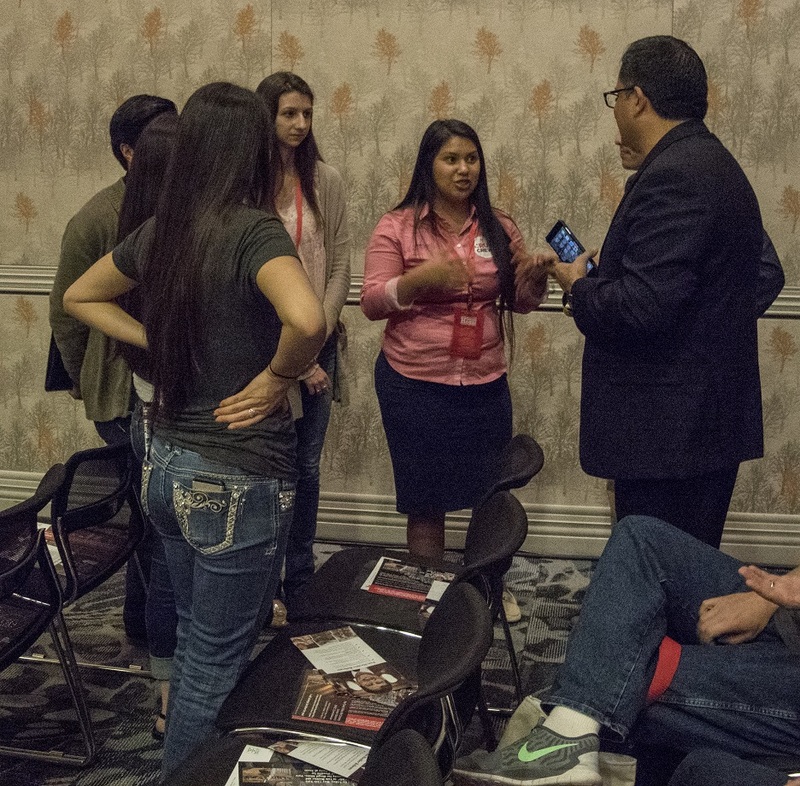 Andy Ngyuen, President of Texas Asian Republican Assembly provided his perspective on being a Republican. His life story as a refugee escaping Vietnam for a better life in America helped exemplify the pursuit of the American Dream, one of freedom and liberty. Ngyuen believes that by upholding these principles, the party would become the moral example of the nation. The final speaker was Senator Jeff Sessions, who served as a kind-of surrogate for Donald Trump. Sessions, who represents Alabama, has endorsed Trump, and is stumping for him on the trail. 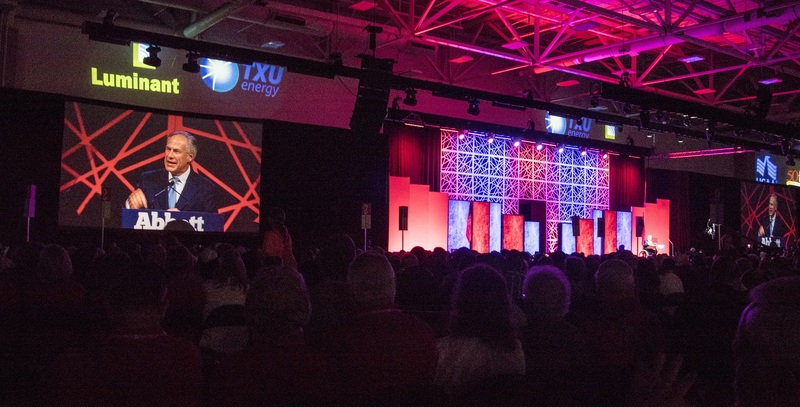 Once the guest speakers were finished presenting, it was time to call the final General Session to order. Our main point of business was to elect a National Committeeman and Committeewoman. After hearing the candidates speak, each Congressional District voted by paper ballot to determine which nominee would be elected. 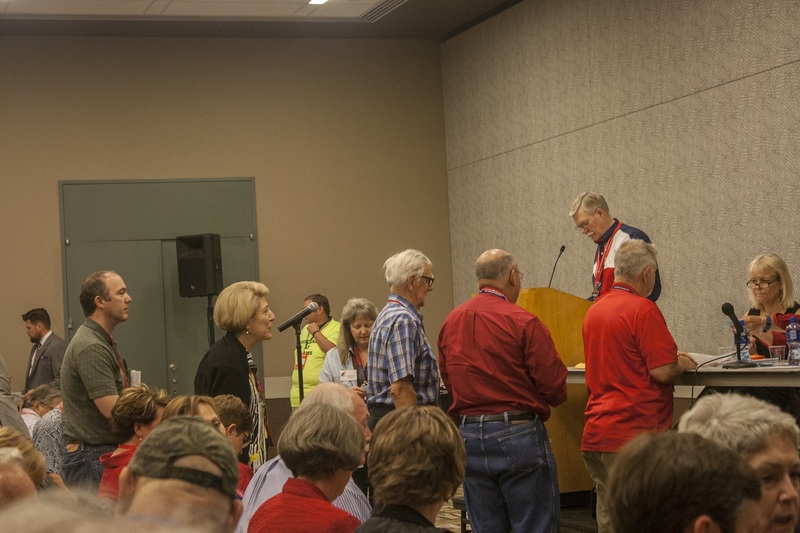 Each Congressional District then reported the numbers to the Convention Secretary during a roll call. Voting by paper ballots was a tedious process, yet it provided more accuracy than a voice vote would have. For Committeeman, Robin Armstrong was reelected. For Committeewoman, Toni Ann Dashiell was also reelected in a surprisingly close election. Although the delegation cast only two votes, it took about an hour and a half to complete! 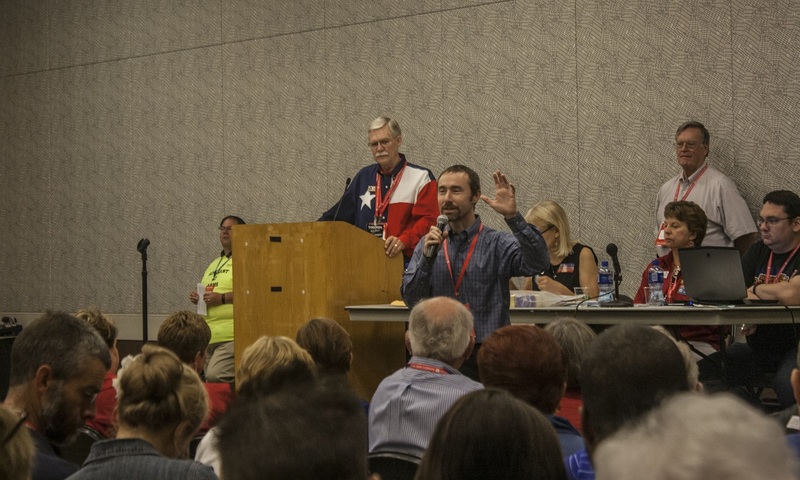 Fortunately, electing the at-large delegates and alternate delegates to the National Convention were easier because they were submitted by a committee and we could approve them as a slate and by voice vote. 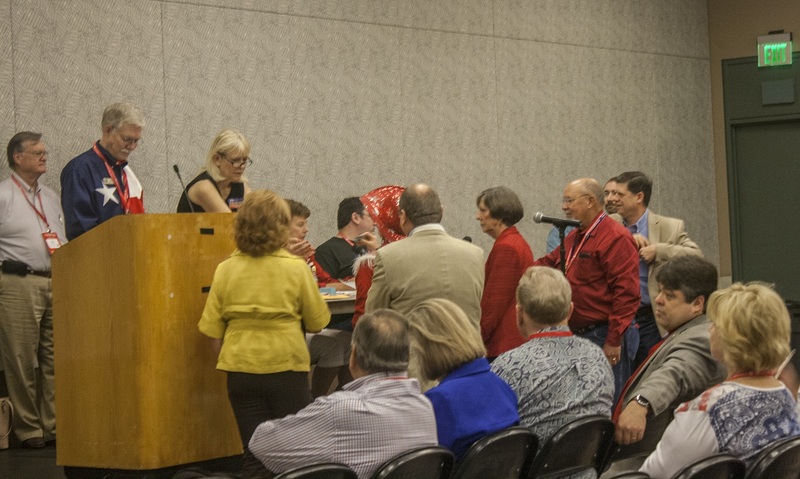 After we approved the two lists of delegates to attend the National Convention on Texas’ behalf, the Convention was adjourned. 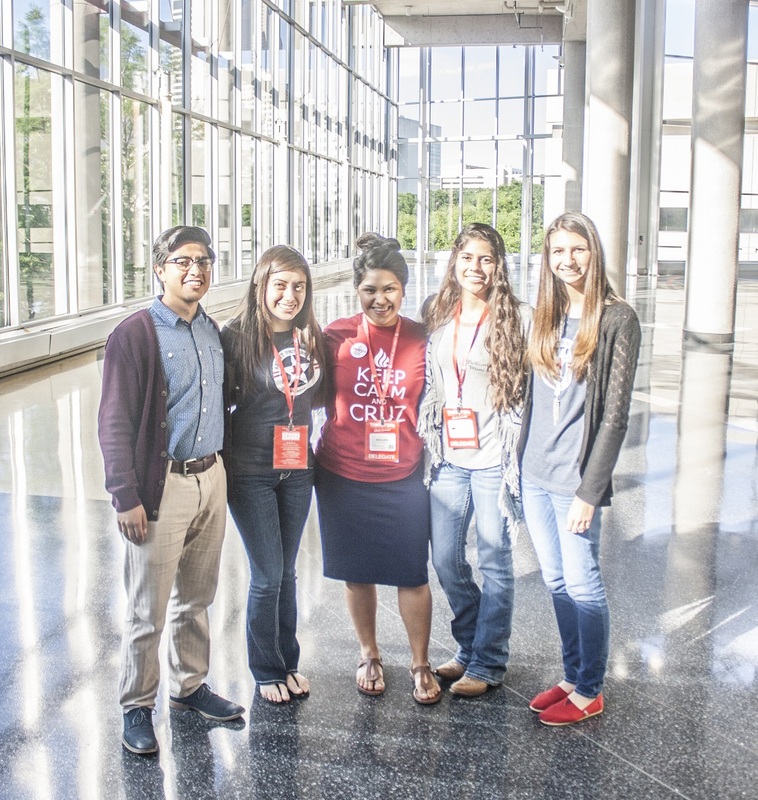 It was an accomplished feeling to know we completed our first State Convention as delegates! 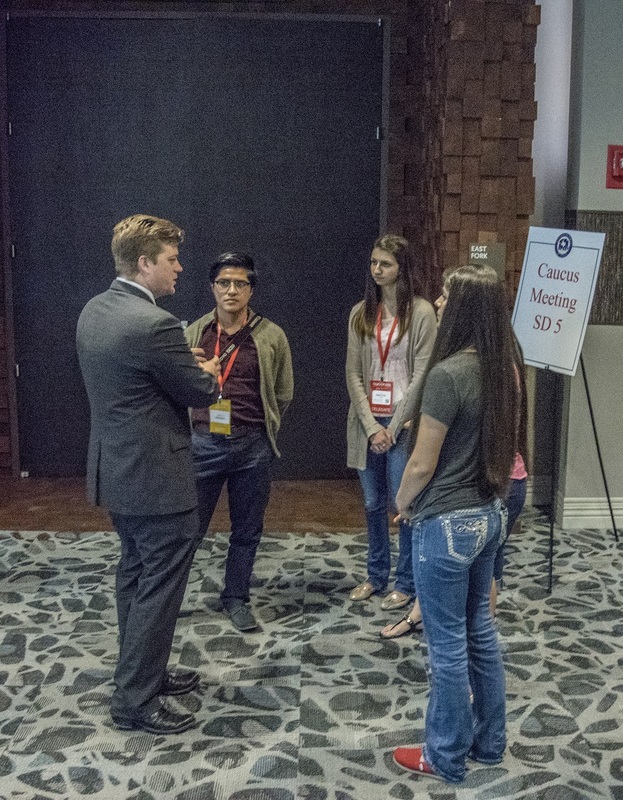 …but we chose instead to think of how lucky we were to be in Walker County, where voters nominated students to attend the State Convention. 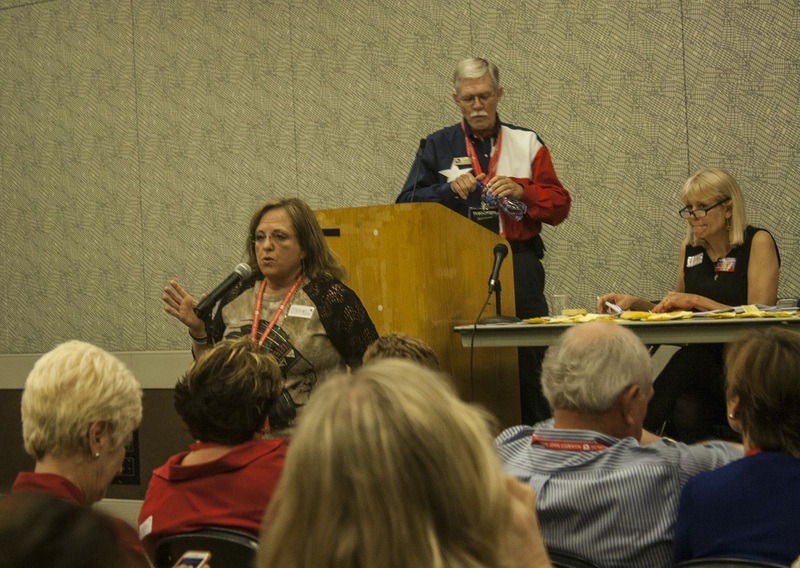 Our initial foray into this type of politics could only have been made more rewarding by the presence of Linda McKenzie and Terry Stivers, both of whom had much to do with our attendance at the convention. Thanks to all the members of the Republican Party who helped make this possible, and we look forward to participating further in the years to come! 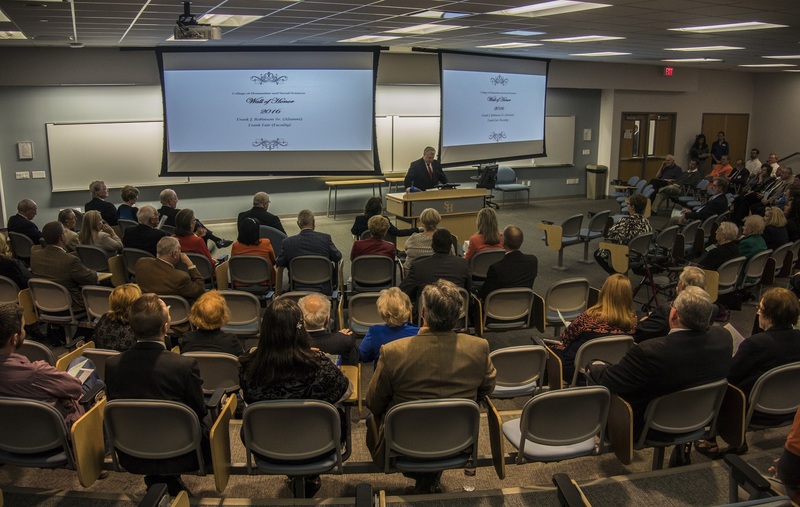 Every year, the College of Humanities and Social Sciences honors excellence, recognizing those that have embodied success as practitioners or in teaching in the halls of academia. This year, the College of recognized Professor of Philosophy Frank Fair and former County Judge Frank Robinson. Appropriately, the evening was marked by warmth, camaraderie, and even inspiration, fitting qualities for the humanities fields. …and Chris Tritico MC’d the event, introducing speakers for both of this year’s recipients. 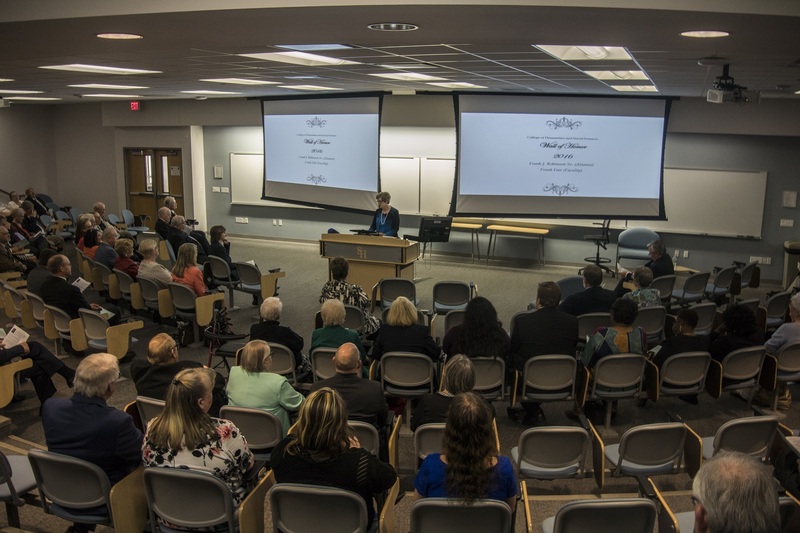 Fair, the faculty recipient of this year’s award, is only the eighth faculty to be recognized by the college, joining Dr. Caroline Crim, Dr. Richard Cording, Dr. Mattie Medford, Dr. James Olson, Dr. John Holcombe, Dr. Joseph Clark, and Dr. Walter Bennett. 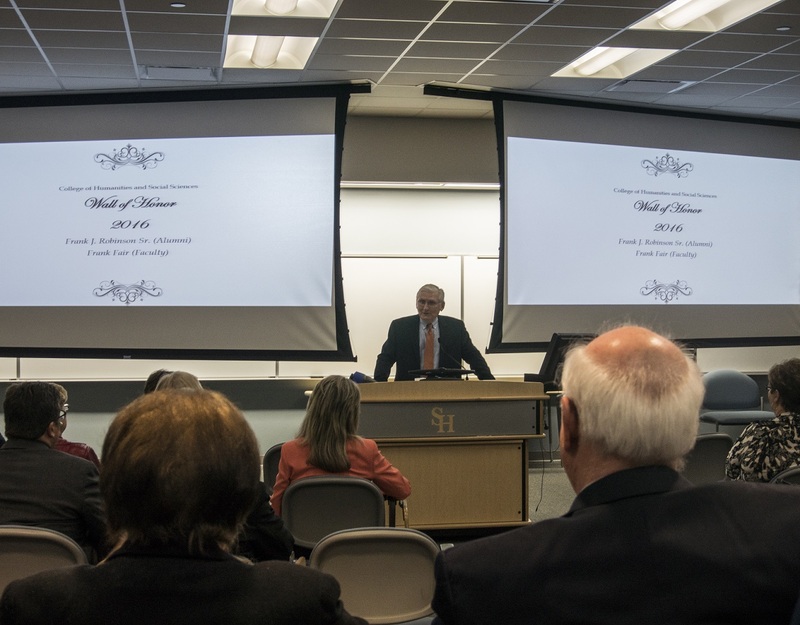 After joining the faculty in 1971, quickly made an impact, being involved in the community and in creating new programs at SHSU. He was instrumental in establishing the college’s teaching conference, was active in the Honors College, the Writing Across the Disciplines program, and in Academic Challenge. Fair also brought the journal Inquiry to SHSU, promoting research on philosophical inquiries and the promotion of critical thinking among SHSU students. (As prospective law students, this caught our attention!) His efforts, deservedly, led to him being awarded with the Excellence in Teaching Award in 1989 and the Excellence in Service Award in 1992. In 2011, he was given the Piper Teaching Award, a recognition given to only ten faculty members across the state. 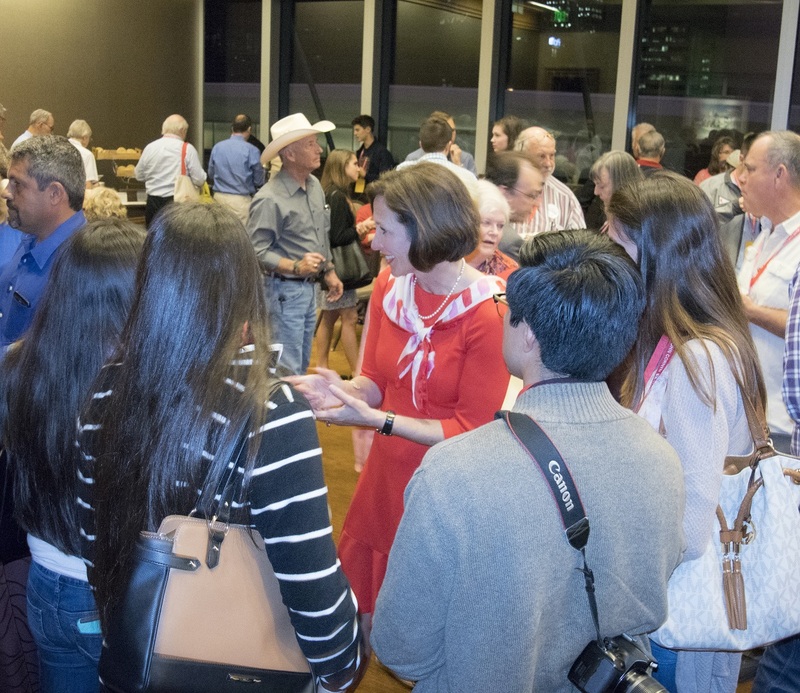 Amidst the sweep of this forty-five year career, CHSS Alumni Advisory Board member Paula Lenz offered an up-close-and-personal view of Fair. With a voice that at times cracked, Lenz noted the impact that Fair had on her life and the way in which she saw the world. Although Lenz majored in English, she took Fair’s philosophical lessons with her, helping her in a successful career as the Director of the North Houston Association. …which included discussions from Fair’s peers, such as Dr. Gillespie and Dr. Botero, the latter of whom learned to drive from Dr. Fair. 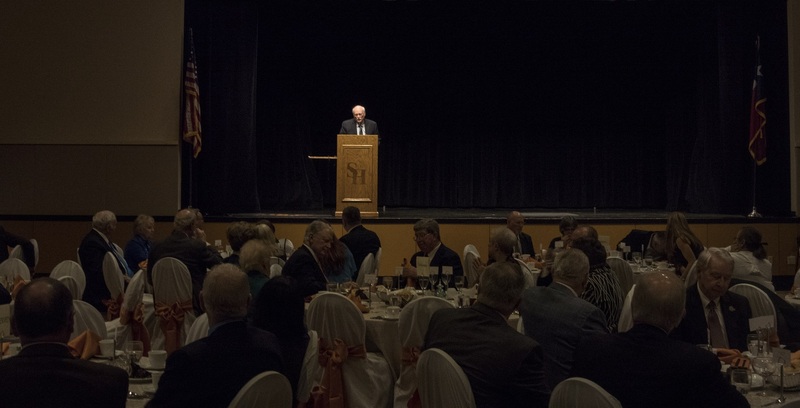 Over dinner, Fair had a chance at his “rebuttal,” and his ten-minute speech illuminated the many qualities that had previously been identified by his peers. His passion for teaching, his concern for students, his gratitude to work at a fine institution with excellent peers, and even in his 70s, an enthusiasm for what teaching will bring in the future. Throughout both his speech and the speeches about him, his wife, Janet, was mentioned repeatedly. Following a long career as a teacher at HISD, she now works for SHSU as a mentor and, like Frank, is a leader in the community. 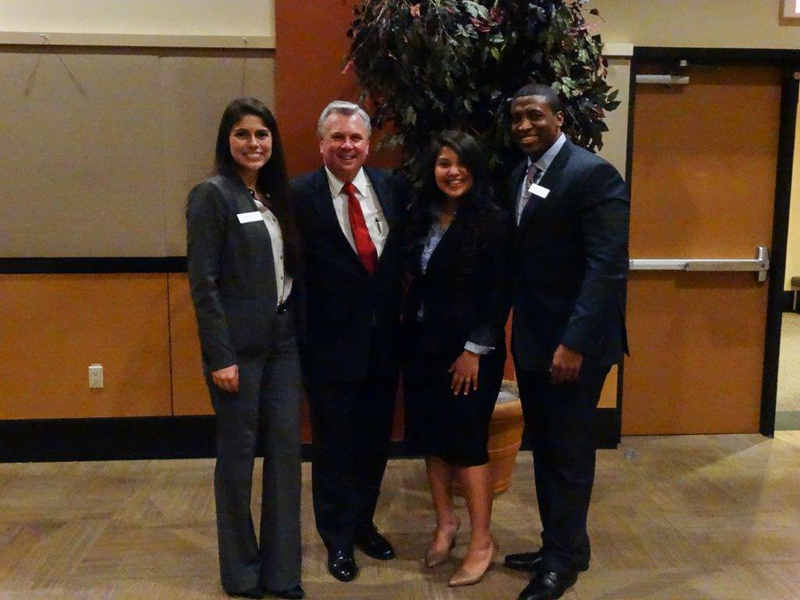 To young political science majors (and one lonely accounting major), it’s inspiring to us as SHSU Ambassadors to see a faculty member who has accomplished so much, impacted so many lives, and maintained the zest for continued service, and we were pleased to meet and congratulate him following the dinner. … community servant, and elected official. Robinson served two terms as County Judge, was President of Rotary, a Distinguished SHSU Alum, and an active member of the First United Methodist Church. 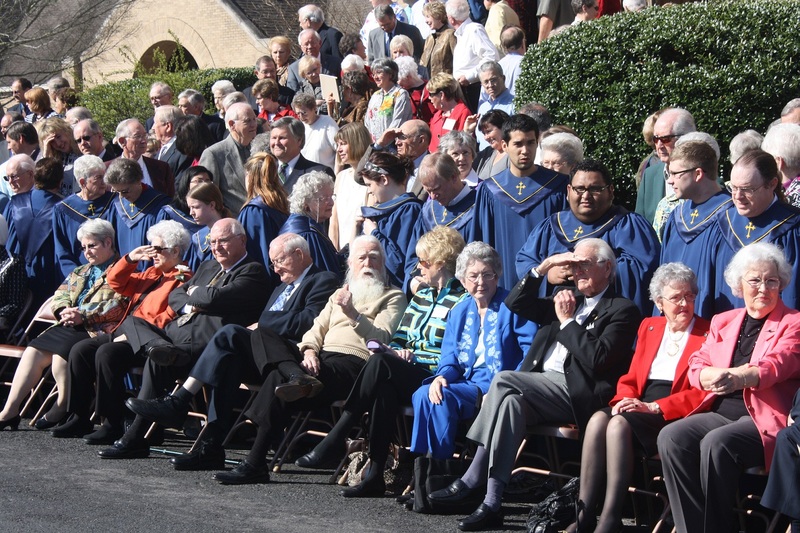 In fact, when the LEAP Ambassadors did a community “then-and-now” photograph of the church in 2012, Robinson was selected to stand (actually, sit) front and center for the outdoor photograph. …but he introduced himself to us, and offered advice and support. We finally had a chance to meet Dan Beto, for whom we’ve long been grateful but not ever actually met. Beto is a member of the George H. W. Bush Presidential Foundation, and when he cannot attend some of their events, he sends us his invitations. Partially because of his generosity, we’ve seen people such as George H. W. Bush, Stephen Hawking, Bob Gates, Mitt Romney, Barack Obama, Ken Burns, and Bud Philbrook. It was fun putting a name with an invitation! We always enjoy spending time with the current County Judge, Danny Pierce, and his wife, Cindy. Amidst this group, it’s likely that you’ll not only hear about service, but you’ll actually see it in action. This time was no exception. 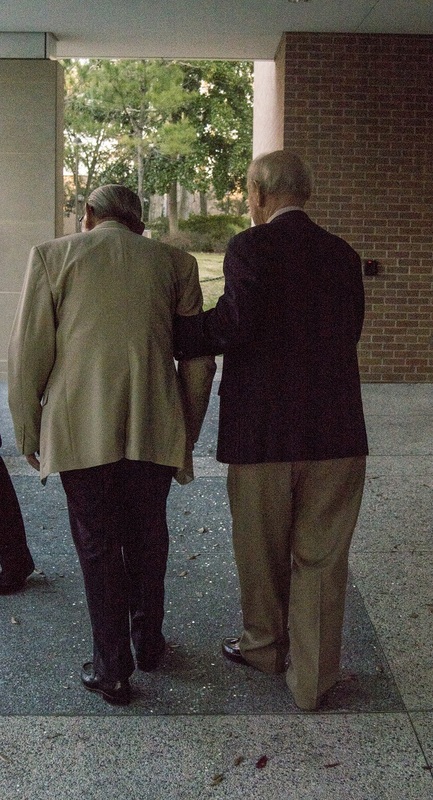 At the end of the Wall of Honor service, for example, we got to see Judge Pierce help WWII veteran Jerry Nemec to the golf cart. We’ve never actually met Mr. Nemec, but we volunteer a lot at the HEARTS Veterans Museum, and we know about his service to the community and the nation. 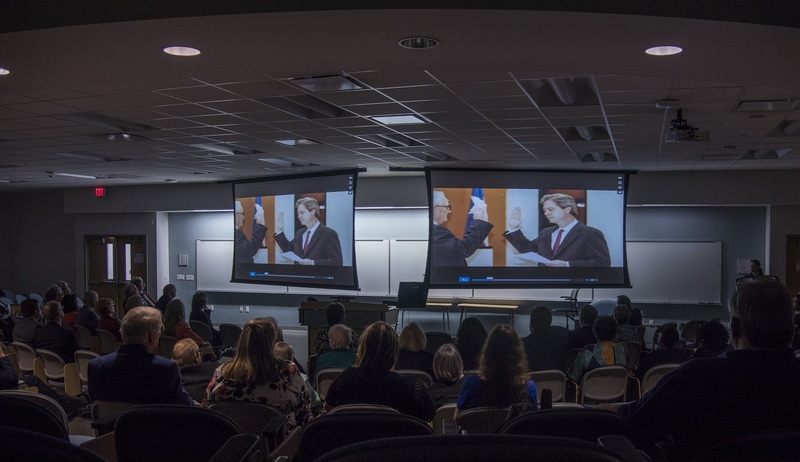 As part of its Mission Statement, the CHSS promotes “personal growth, competent professionalism, and responsible citizenship” and Dr. Fair and Judge Robinson–along with the many nice attendees–did a great job of embodying those qualities and illuminating the importance that humanities plays inside and outside of the classroom. Dr. Abbey Zink is the Dean of CHSS. Her staff, Brenda McNeely, Christine Reeder and Deanna Briones did a great job of putting this event on. The CHSS Alumni Advisory Board helps oversee the nominations process and they vote to select the honorees. It was an honor to assist with this event.